Well the science cookies seem to be a big hit and I really like making them, so I am going to continue to indulge my science geek side. 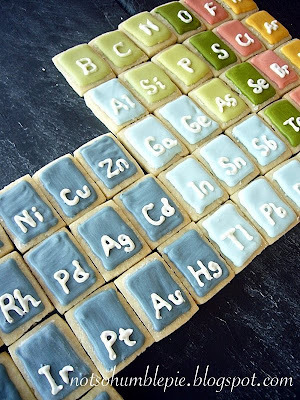 Periodic table cookies? Chemistry and baking are very much alike, right? They both utilize precise measurements and techniques in the hopes of getting just the right chemical reaction. Sometimes while tinkering around you create something amazing... and sometimes you just get a really nasty smell. Really the only difference is, in chemistry you never get to lick your spoons. I'm not sure the evening following Thanksgiving dinner was the best time to attempt these. I was pretty tired and I know that tends to make me sloppy, not exactly the ideal mindset for making iced cookies. I admit I plowed through making these. However, despite my 2 hour rush job, I think they turned out pretty darn cute. Yes, I know I left off the lanthanides and the actinides (and those flakey unun-elements too). I ran out of dough, sorry. When I make these cookies again (only bigger and more awesome!) I'll be sure to include them. These are so creative! What a great idea. Yeah, I can imagine how tired you were right after Thanksgiving. I also tend to get sloppy when I'm tired. Yours certainly don't look sloppy but I can't wait till you make them again and post the results. I bet they were delicious too. Wonderful job! This is you when you're tired? Incredible. You should see the ugly, lopsided gingerbread house I am attempting to cull together for my kids. And I'm _not_ tired. AND I took a lot of chemistry. So, no excuses for me (except that C in inorganic, I suppose). Questions: Are these shortbread? Or sugar cookies? what kind of icing? Confectioner's plus milk? Or royal icing? Or something else entirely? Rule of Life #124: Doing even remotely well in inorganic or O-chem gives you a pass on any and all gingerbread house failures for life, as that is a far more impressive feat. Same goes for P-chem, which also forgives overcooking fish, broken sauces and fallen soufflés. These are sugar cookies (recipe I almost always use is here--only I add a little almond extract to my dough) and I used royal icing for these (confectioner's/meringue powder/water). I found a cookie cutter that will let me make nice large clean tiles for the elements yesterday. Hand cutting these with a ruler didn't work as well as I would have liked, so the next version will have a far more polished look for sure. Wow! These are so SO great. As is the petri dish. I'm currently blowing off my Orgo, Bio, and Physics reading for the night to peruse food blogs and this was exactly what I needed to convince myself I made the right decision :D I really cannot wait to make these for the next party I go to...thanks for sharing! Okay, okay, I was impressed by the petri dish cookies, but this one is just stupendous! I have to mention this on my blog! I am tempted to forward this post to my husband (he'll love it) but I know that he will want me to make him a periodic table of biscuits if he see's yours! This is beautiful! I made a Periodic Table out of mini-cupcakes for National Chemistry Week. It was a nice practical way to accomplish the task and include all elements through 112. But it wasn't nearly as pretty as yours, and probably not as tasty either. Maybe next time you could include the lanthanide and actinide subgroups aswell... more cookies! This WAS the coolest thing I'd ever seen... unitl I saw you sushi cupcakes! You've got a rare talent. Now you are dedicated, that must have taken forever! Fantastic idea! Must copy it immediately. Thanks so much! What? No lanthanides or actinides? Where the f-block love? My husband is an industrial chemist (charading as a program manager at the moment) and occasionally has to take morning tea, I can't wait to make these and your atoms for him! They'll have a ball with them (and because I know little about chemistry will be forgiven for them not being completely accurate - I'm thinking the atomic cookies). I must say- love your science cookies. I'm always impressed at how many scientists are mean bakers too...:). I can make things that taste good...I'm still working slowly on the prettying it up part. You've given me so many geeky ideas. Thanks! I'm glad Make Magazine found your blog! You inspired me to construct a periodic table of cupcakes for my book launch. Thank you SO much for this fabulous idea. 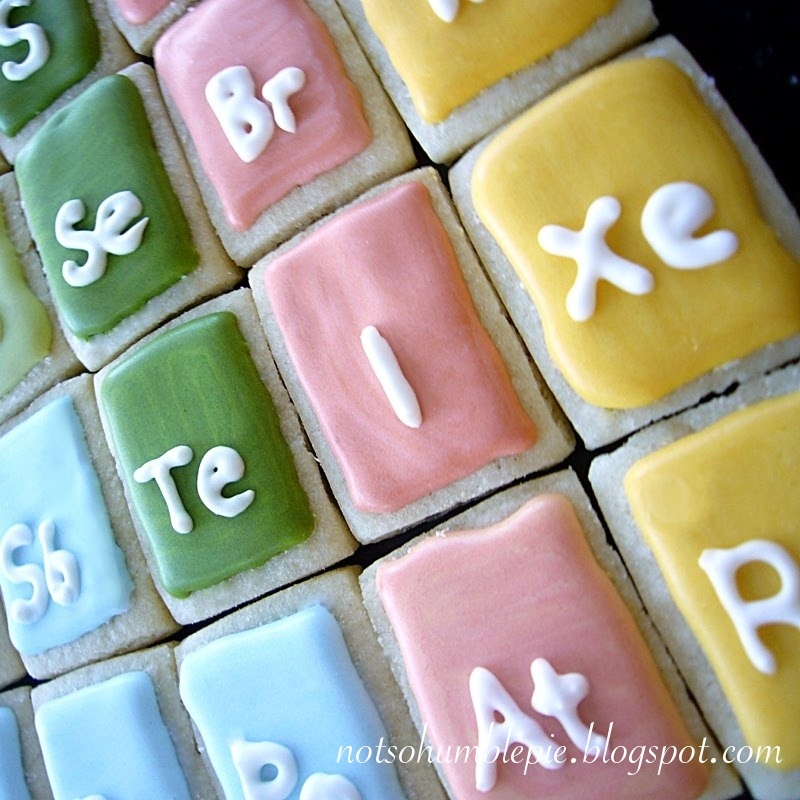 I'm graduating from college this May with a degree in Biological Sciences and am planning on making these and probably also the gel electrophoresis cookies for my graduation party!